PORT-AU-PRINCE, Aug 1 2013 - As the government works on preparing “an attractive law that will entice investors”, Haitian popular organisations are mobilising and forming networks to resist mining in their country. Already one-third of the north of Haiti is under research, exploration, or exploitation license to foreign companies. Some 2,400 square kilometres have been parceled out to Haitian firms fronting for U.S. and Canadian concerns. Some estimate that Haiti’s mineral wealth – mostly gold, copper, and silver – could be worth as much as 20 billion dollars. The awarding of permits behind closed doors, with no independent or community oversight, has angered many in Haiti, who fear that the government is opening the country up to systematic pillage. But the head of the government mining agency told Haiti Grassroots Watch (HGW) his concern is to assure that Haiti is made more “attractive” to potential investors. The current law is obsolete, according to Remarais. Haiti’s “gold rush” has been going on for the past five years or so, since the price of gold and other minerals rose. Until last year, the government and the companies cut their deals behind closed doors. After an investigation revealed that 15 percent of the county was under contract, on Feb. 20, 2013 the Haitian Senate adopted a resolution demanding all activities cease in order to allow for a national debate and for analysis of all contracts. “We are scrupulously respecting the decision,” Remarais said, but he added that the resolution does not annul the rights already acquired. Peasant, human rights, food sovereignty and environmental organisations are worried about the disastrous effects the mining industry could have on water quality, farmland, and on the affected regions in general and have formed the national Collective Against Mining to assist local associations with information and consciousness-raising sessions. On Jul. 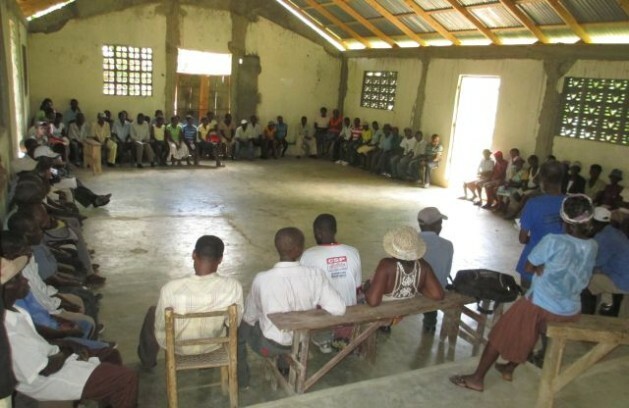 5, over 200 farmers from the area around the Grand Bois deposit – about 11 kilometres south of Limbé, in the North department – got together to discuss the mining operation and their futures. They spoke of their worries for three hours in sweltering tin-roofed church. The Grand Bois deposit is rich in gold and copper, according to tests carried out by the Canadian mining company Eurasian Minerals. Eurasian owns the license given by the BME to its Haitian subsidiary, Société Minière Citadelle S.A.
During the meeting, many people said they were nervous. Two weeks earlier about 50 members of local and national organisations met in Jean Rabel, an impoverished town in the Northwest department with poor roads and no water system or health facilities. Participants watched and debated a video on mining in Haiti and discussed their next steps. Earlier that month, some 60 representatives of the associations in the collective organised a day-long meeting at Montrouis, northeast of the capital. Of particular concern are the protection of ground water, food sovereignty, agricultural land, biodiversity, health, and land ownership. Clébért Duval, a member of the peasant association Tèt Kole Ti Peyizan Ayisyen (“Small Haitian Peasants Working Together”) from Port-de-Paix, noted that a state that is working in favour of its people could use mineral resources to “change the conditions of the popular masses, peasants, vulnerable people, and could give this country a new face”. Many rejected the officials’ arguments that mining is important for the country’s development and economy. “In 2012, some companies did prospecting,” said Vernicia Phillus, a member of the Tèt Kole women’s coordination in Baie de Henne. “They took away soil and rock samples. Each person who worked for them got between 200 and 250 gourdes (4.65 to 5.81 dollars) a day. In early June, the Haitian mining agency and the World Bank organised a “Mining Forum” aimed at developing “the mining sector in a way that makes it a motor for the country’s economic takeoff.” Most of the speakers were from foreign institutions and from mining companies. Parliamentarians, local elected officials, independent geologists and researchers, representatives of the people from the regions concerned, and grassroots organisations did not address the room. One of the meeting’s principle objectives was allegedly to sketch out the general contours of a new mining law for the country, even though World Bank officials said they had kicked off that process earlier this year, according to media reports. During the Jun. 3-4 forum, Prime Minister Laurent Lamothe said that his government was working with “competent experts who have [Haiti’s] national interests at heart”, according to the Associated Press. But World Bank involvement with the law appears to be a conflict of interest. In 2010, the International Finance Commission (IFC), a branch of the bank, invested about five million in Eurasian Mineral’s Haiti operations, receiving Eurasian shares in exchange. The World Bank is often criticised by organisations like Mining Watch Canada, Earthworks, and others for being lax where the protection of poor countries is concerned, and for its role in the “continuation of colonialism” in Africa, Asia, and Latin America through its important loans to mining companies. In March, the U.S. government representative to the World Bank abstained in a vote to approve a bank loan for 12 billion dollars to a mining operation in the Gobi Desert, citing concerns over potential negative environmental impacts. The bank loans were approved anyway, according to Inter Press Service. Asked about an eventual new law that would be “attractive” and capable of “enticing investors”, the director of DOP, a member of the Collective Against Mining, said he was concerned. “Business, without considering the deleterious effects on community life and on the environment, which is already deteriorating at a worrying pace,” he added.